From the meeting place a short train ride brings us to the Biwako canal which we follow to Bishamondo, famous for its colourful autumn foliage. After viewing the surroundings of the temple we take the subway to Daigoji, a Unesco world heritage site. 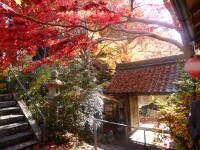 We will visit the temple precinct and afterwards hike to Zuishinin. This tempel has a beautifull garden, but there will also be a miss contest in honour of Ononokomachi, a famous beauty in Japanese history. You can see colourful kimonos with a beautiful garden in the background. from there we take the subway back to Kyoto. Or you can enjoy beer and German food at Doitsu Link Restaurant. Meeting Place: In front of the wickets of Yamashina JR station. Yamashina subway station is just on the opposite side.